Best Places to Stay on Lake Michigan. Enjoy Michigan's romantic accommodations. Here's where you'll find those Lake Michigan accommodations you've dreamed about. Choosing romantic places to stay along Michigan's West Coast is an easy task. From the Mackinaw Bridge, south to New Buffalo, there is over 350 miles of pristine shoreline and sleepy little beachtowns. We want to provide you with the best information on Lake Michigan accommodations for the northern, central, and southern Michigan areas of this spectacular coast. Whether you like being pampered at luxurious hotels ... or (like us) ... the slower pace of cozy little inns, you can find plenty of Lake Michigan places to stay that fit your style. 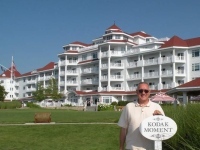 Michigan resorts are known for hospitality and friendly staff. Come discover how Michigan resorts offer the perfect getaway, vacation or honeymoon spot for that unforgettable romantic experience. With so many Lake Michigan attractions you're sure to find something that is fun and interesting to share together. Keep in mind that staying on the water puts you at the high end of room rates. A short drive, or willingness to walk a few minutes to the beach, can result in really big savings. Always ask about package specials and discounts for travel clubs, wedding party's, AAA, AARP, etc. If you are a veteran be sure and ask about veteran discounts that may be avaiable. The off season at Lake Michigan is a great time for a romantic getaway. You'll save money and many Michigan resorts partner with local restaurants for meal deals. The lake still offers spectacular sunsets and know you will discover the magic each season has to offer withour feeling rushed. Have you found a great place to stay? A resort, Michigan inn or hotel? Share it with our readers. Most of the Lake Michigan accommodations are offered as two for one deals and extended stays have deeper discounts. We have our favorites that we visit as often as we can. If you find a great Michigan romantic getaway, be sure to let us know so we can share it with others. Please, check back often for updates, or to contact us about your special finds, as we continue to build the list of places to stay on romantic Lake Michigan. Michigan Beach Resort Or Hotel-Whether you like being pampered at swanky hotels, or just a clean room to hang your hat, you have plenty to choose from. 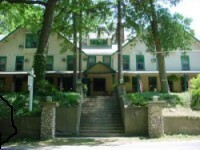 Lake Michigan Inns-Our favorites! We love the slower pace that these charming inns offer. Bed and Breakfast-Always cozy, and the owners really go out of their way to please you. 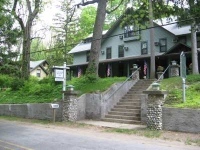 Lake Michigan Vacation Rentals-Choose from many homes, cottages, and cabins, located on or very close to the beach. Go to sleep with the sound of the waves lapping the shore. Talk about neat places to stay. How about a free week stay at one of Michigan's beautiful lighthouses. 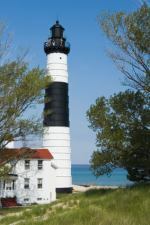 Visit our Lake Michigan Lighthouses page and check out Grand Traverse Lighthouse in Northport, and Big Sable Lighthouse in Ludingtons stay for free programs. Talk about an affordable romantic getaway! 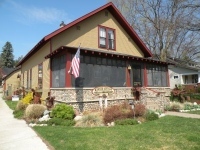 From Places To Stay back to Romantic Lake Michigan Home Page.